Today's collectors and computer restauration experts like to keep a separate computer with a full OCS chipset and just a trapdoor memory expansion for the classic 0.5M ChipMem and 0.5M RangerMem configuration. With many second-source memory expansions using megabit memory chips, the setup will tend to run unstable, because the OCS Agnus types 8370 and 8371 will not generate enough refresh addresses for most trapdoor memory expansions that use less than 16 memory chips. 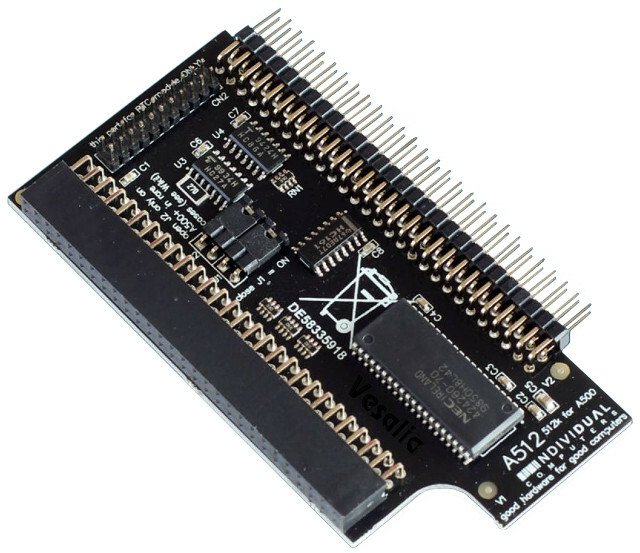 The A512 memory expansion will run properly with all Agnus types, including OCS chips. Thanks to an additional refresh circuit, the single 4Mbit memory chip will get enough refresh addresses to keep its contents in any configuration. When operated in an A500+ computer, the A512 will be used as ChipMem, and two of these expansions can be cascaded to reach the maximum configuration of 2 MBytes of graphics memory (1 MByte on the main board and 1 MByte in the trapdoor slot). The pass-through port is compatible with any other 512K trapdoor expansion as long as it fits mechanically. The A500+ on-board RTC is only switched off if the RTC module has been installed on the A512 card. The A512 memory expansion is compatible with all motherboard revisions from Rev. 3 to Rev. 8, including the A500+.